The sessions are expected to continue throughout the month of October and will cover a range of topics related to parenting. The Roving Caregiversâ Programme (RCP) is spearheading this venture with the partnership of the Caribbean Internship Project (CIP) of the University of the West Indies, Mona. With a needs assessment having been done in 2007 by an intern attached to the RCP, the continuation of the work has now been scheduled. 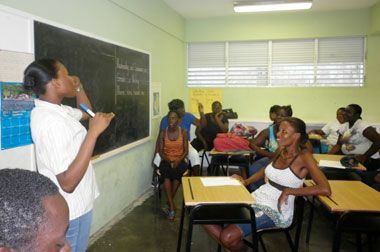 Members from the communities sat together in a meeting with the Social Worker attached to RCP, Dainty-Ann Barrett, during the month of September, to discuss the strengths and weaknesses of the communities. It was out of these community discussions that the issue of parenting was identified as a serious problem and one community members thought they, with some training, could address together. The training sessions will be practical, yet theory-based sessions, guided by the âPathways to Parentingâ manual and will occur twice per week for the month of October. All topics of parenting are expected to be covered: from nutrition for toddlers to learning to speak to adolescent children. However, there will be special emphasis put on early childhood education as the RCP seeks to equip mothers and fathers with the best tools to rear their child or children. In addition to these parenting workshops, the parents from the community decided on having an after-school programme, which is scheduled to begin in the month of October, as another opportunity to address the learning problems the children of the community experience.